Three of the four militants killed by security forces in a St. Petersburg apartment block on Wednesday were terrorist leaders involved in high-profile attacks in Russia’s North Caucasus, the National Anti-Terrorist Committee (NAC) has said. 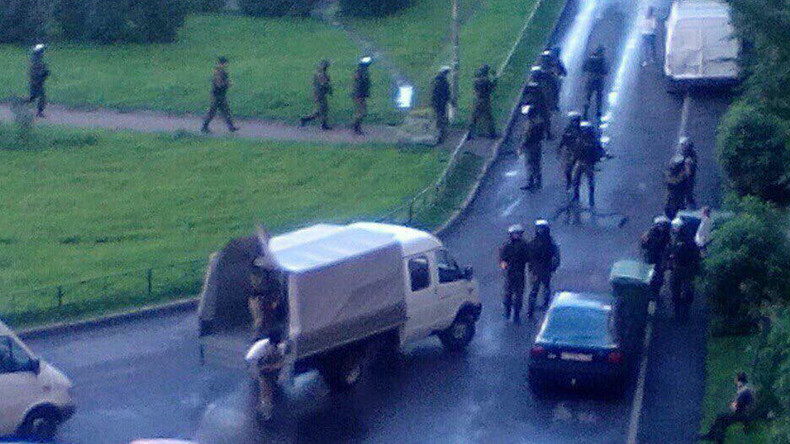 Four suspects “received lethal wounds in a swift gunfight” with FSB (Federal Security Service) Special Forces in an apartment block in the Kirovsky District of St. Petersburg on Wednesday, the NAC said in a statement. Three of the armed gang members killed have already been identified as Zalim Shebzukhov (born 1986), Astemir Sheriev (1991), and Vyacheslav Nyrov (1982), it added. Спецназ Росгвардии оцепил жилой дом на Ленинском проспекте. “All three of them were on the federal wanted list as the leaders of the terrorist underground on the territory of [the Russian Republic of] Kabardino-Balkaria. They were directly involved in a number of high-profile terrorist crimes, including attempts on the lives of law enforcement officers and prosecutors,” the anti-terrorism body said. Automatic weapons, ammunition and several improvised explosive devices were discovered in the apartment, which the terrorists used as a hideout, the NAC said, adding that no civilians were hurt during the operation. The anti-terrorism operation lasted four hours, and witnesses told local media they heard at least two explosions and shooting in the 16-story building. “During their detention, they [the suspects] resisted and attempted to kill the officers by opening fire. Four suspects have been killed,” Russia's Investigative Committee spokesman Vladimir Markin told TASS. Social media users shared photos and videos showing a number of police cars and heavily-armed officers around the apartment block in Russia’s second-largest city. The officers did not evacuate the building but did prevent people from entering, witnesses told the Fontanka website. “Small groups of Special Forces are emerging from the entrance, while others go inside,” a witness told Fontanka. Photos shown by local media depicted people in chemical protection suits on two balconies. According to Fontanka, a Special Forces officer was carried from the building on a stretcher. When the operation concluded the officers collected several white cardboard boxes and left, RIA Novosti reported.